Wherever you need privacy, there's a way to incorporate Hy-Lite acrylic block products. That includes in commercial projects like beauty salons, dental offices and hospitals ... even animal hospitals. "There are businesses that require secluded spaces to function, and acrylic block partitions can make that happen in an elegant way," says Laura Sikes, marketing manager at Hy-Lite, a U.S. Block Windows Company. In Portland, Oregon, Dr. Elizabeth Colleran, DVM, was able to create private spaces for her furry patients and their owners at the Cat Hospital of Portland. "We wanted unique spaces with lots of light and privacy," says Dr. Colleran. "The design/build firm we worked with recommended Hy-Lite radius walls to fulfill this need. Both my patients and their owners seem extremely comfortable in this bright, carefree setting." 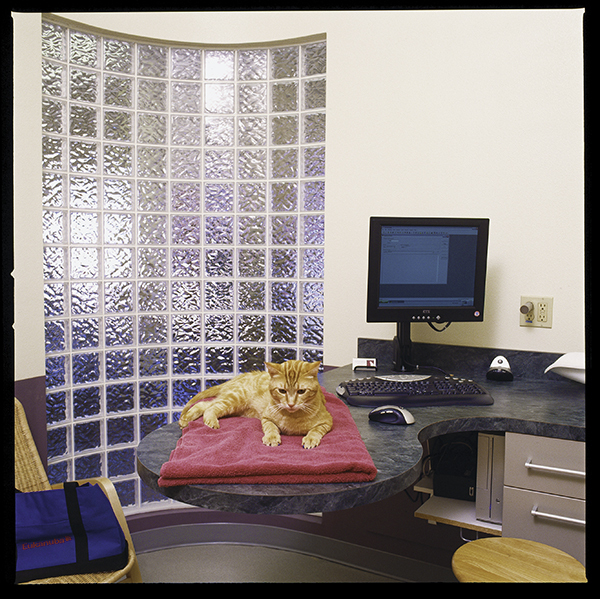 To "untrap" light in the Cat Hospital, Hollis Elliott, owner of Hollis Elliott Construction, jumped in with the recommendation of three clear wave radius acrylic block walls in the examination rooms. "We wanted to help the light flow from outside the building's street-side glass front into and throughout the building structure, says Elliott. "The Hy-Lite radius walls make the interiors of the examination room feel bigger, lighter and more inviting. Overall, the acrylic block products accomplished our goal of creating an openness to the building without being cost prohibitive or labor intensive to install."